Pull a vast list of key contacts at the quality departments of many different institutions with this pre-built data set. Find the emails, phone numbers, and other contact information of those working in quality assurance or quality control departments easily. Consolidate quality-related contacts from multiple companies into one convenient, accurate, easy-to-use, and easy-to-integrate database with this powerful product from Bookyourdata.com! Find quality assurance and control professionals and start networking with them moments after downloading this email list. 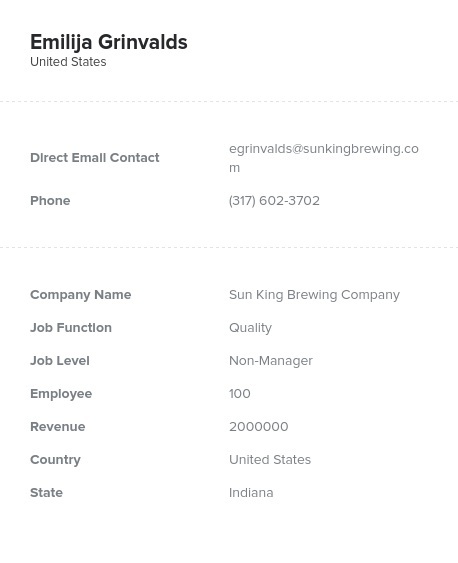 Gather the contact information of these QA/QC professionals into one place, including their emails, titles, company information, names, numbers, addresses, and more. Integrate this data file into your CRM, and start marketing to quality assurance and control staff fast. Connect with these powerful individuals if you want to market your company's product or service, especially if it can help them assure quality, manage processes, organize resources, watch maintenance, or schedule important tasks. Network with the experts, market your products, and find the leads that fit into your niche, business-to-business target group in QA. Quality staff and professionals are the key group that ensures that every product a manufacturing or production company makes is of a standard, high quality. Quality assurance is process-oriented, whereas quality control is product-oriented. However, both QA and QC are vital to an organization's end products. Download this pre-made list, or feel free to customize it further. Buy this list and assure quality assurance professionals of your company's great qualities!